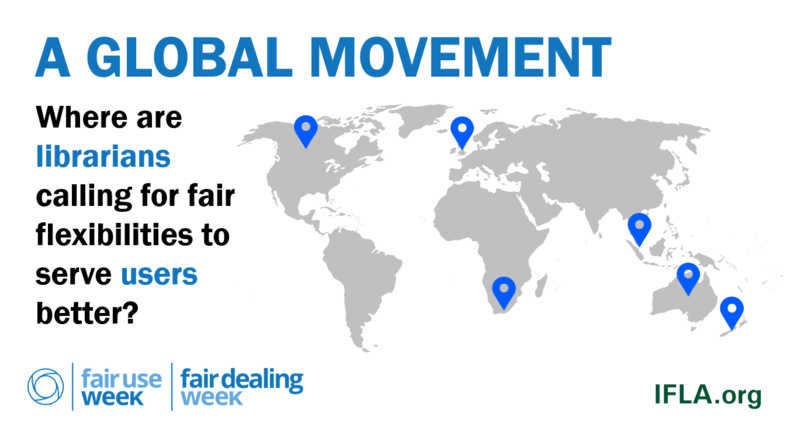 This week is Fair Use/Fair Dealing Week. It’s an opportunity to look at where librarians around the world are involved in efforts to defend and promote Fair Use and Fair Dealing. They are doing this because copyright rules that give librarians the space to adapt and update their practice make it easier to fulfill libraries’ mission to preserve and give access to information. Therefore, while IFLA is directly involved in calling for reform at the global level, we also engage with our members at national level to promote positive legislative change. The goal – to promote exceptions and limitations that give libraries flexibility, but at the same time do not cause unreasonable harm to rightholders. In 2012, a copyright reform expanded the Canadian fair dealing provision to also apply to educational purposes. Coming in the middle of a trend towards greater use of digital materials, and falling photocopying volumes, this has been blamed for the difficulties faced by some publishers. The decision of some to stop paying fees for photocopying has certainly led to a fall in income for the relevant collecting society, although the jury is out on the overall impact on rightholders. Indeed, university libraries themselves are paying more and more for content, which is increasingly digital. It is therefore unlikely that the fair dealing reform is to blame for a net drop of revenues in the publishing sector, or that flexibilities in copyright per se should be understood as a threat. An ongoing review of the 2012 reform will hopefully shed more light on the issue, and underline rather the positives for Canada’s education sector. South Africa’s copyright reform is close to an end, and if adopted as it currently stands, will represent a significant improvement for the library sector. While South Africa has had fair dealing for many years, the copyright reform looks to introduce a full fair use exception. This consists on a non-exhaustive list of uses (research, criticism, reporting current events, teaching, comment, parody, preservation, etc.) for which uses can be deemed fair, as part of a four-factor test that is close to the US model. While there are many other relevant provisions in the Bill, there has been a lot of controversy over this proposal, including extensive mischaracterisation of what it would mean. The library sector has repeatedly had to bring arguments to the table to rebut myths about fair dealing. The Australian government is going through a period of copyright reform, and welcomed submissions in 2018. The country currently has fair dealing, with a closed list of activities where activities can be considered fair. Librarians have advocated for a change to fair use, or at least a longer list of permissible activities, including text and data mining, library archive and use, and certain educational uses. At the same time, the publishing sector argues that fair use would be undesirable. The Australian Productivity Commission, which carries out economic assessments of the benefits and costs of reforms, has spoken strongly in favour of fair use as an approach. The New Zealand government announced a copyright review in 2018. As in Australia, New Zealand currently has a fair dealing provisions and specific exceptions, limited to the purposes of criticism, news reporting and research. It is likely that there will be controversy around the fair dealing provisions, including resistance from established rightholders to making copyright flexible at all, and encouragement from groups representing users to expand it or turn it into a fair use provision with no prescribed activities. The call for comments is still open, and we wait to see what will come of this. Singapore is a currently fair dealing country, although it already allows a wide variety of purposes to be classed as ‘fair’. Nonetheless, change is on the way, following a consultation two years ago, and a recent set of proposals for further form, including a shift to full fair use. The proposals also contain some very positive library provisions, with exceptions that would make it possible for our institutions to continue providing a public interest service, now in the digital age. Here too, there is likely to be opposition to the idea of more flexible copyright. Draft legislation is expected later in 2019, with further possibilities for comment. The United Kingdom has been influential as the origin of the fair dealing doctrine and has continued to innovate in recent years. In 2013, for example, it made it clear that text and data mining could fall under a research exception, and ensured that copyright exceptions and limitations are protected from contract override. With Brexit underway, the UK Intellectual Property Office is looking at adjusting the copyright framework to the political changes. For that purpose, and among other things, a consultation is underway, currently with an open call for evidence. The consultation focuses on three topics: the archive exception; other copyright exceptions, including research and private study, text and data mining (TDM), education, quotation, and parody, caricature and pastiche; and, extended collective licensing and orphan works. For now, at least, fair use does not seem to be on the table, although if there is a break away from EU law, there could be possibilities to promote it. As the Crews report shows, there’s several other countries where either fair use or fair dealing exists, for instance Israel, Republic of Korea, Sri Lanka, the United States, Bangladesh, the Philippines or the Republic of Korea. IFLA continues to monitor legislation here, and elsewhere, in order to give libraries the best possible legal framework for achieving their missions. For more detail in these and other copyright reforms, check our copyright database and feel free to add comments for any updates you have.